Let me start out by saying that I don’t mental health lightly. This post is by no means makes fun of anyone who is afflicted with this horrible and debilitating illness. That said, I’ve suffered two panic attacks in my life. My second one happened just the other day. The first time I had a panic attack, I wasn’t exactly sure what was happening. I have had friends try to explain the feelings associated with a panic attack to me and without actually experiencing one personally, it was difficult to fully grasp what it actually felt like. 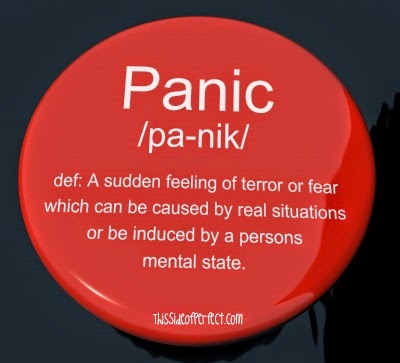 To an outsider, a panic attack is a lot like any other mental illness. We are quick to dismiss it as an “overreaction” or “illogical”. By talking to friends, I understand that for many, it happens when they are overwhelmed. Rather than take what is happening at face value, analyzing the situation, and coming up with a solution to it, they think about it in such a way and for so long that they are literally paralyzed by it. As with a lot of mental illness, I don’t think it always makes sense to those who don’t suffer. That’s why it’s an illness. It’s not a normal state of consciousness. This is not to say that someone who suffers from panic attacks isn’t validated in their feelings. They are. The feelings are real. The physical effects (heart palpitations, dizziness, fear, etc.) are very real. It is all real and none of it should be discounted. And it wasn’t until I experienced my first panic attack that I really understood how debilitating it is. My first panic attack came on suddenly. I was thinking about what I needed to do and then suddenly, a rush of emotions came to me. I became very frantic in what I needed to do and I felt like it had to get done immediately. The only problem was, I didn’t know where to start. I didn’t know what to do. Worse, I couldn’t catch my breath. My mind was racing. Deep, deep in the recesses of my mind, I knew that what I was thinking wasn’t rational. (Yes, my to-do list was very long. Yes, it was overwhelming. But what I was doing/feeling at the moment wasn’t doing a thing to help the situation.) My rational mind realized all of this. But it was my panicked mind that prevailed. I wouldn’t function. I couldn’t process. What’s worse is that the only one around to see it was The Boy. My oldest child who, as a man-child, was desperate to fix things and couldn’t. I remember the look of terror on his face as he was trying to process both what was going on and what I might need (or what he could do) to fix everything. The aftermath of the episode (which lasted all of five minutes) was equally terrifying. I sat on the bed attempting to process the events of the past few minutes. I couldn’t. The Boy was still scared. I hated that I did that too him. I hated that he had to see it. My second panic attack happened a few days ago. I became overwhelmed with everything I had to do at school for work and at home. This time, I was in the car with Baby Girl, on the way to a doctor’s appointment out of town. This time, I kept it well hidden. I couldn’t possibly panic in front of my youngest. A child, who is currently being treated for anxiety. No, this child I had to protect. And is the case in most of my mothering career, I learned from my mistake with my oldest child what not to do with my youngest. So, instead of showing my panic by voicing my thoughts, I kept them in my head. For 45 minutes – the length of the trip, one way. By the time I got to the doctor’s office, I couldn’t breathe. I couldn’t think. I frantically sent The Man Beast rapid-fire texts that shut down his phone (no joke). He’s seen me like this before, so he immediately called me. We talked for ten minutes and he was able to calm me down. I was then able to join Baby Girl back in the office and proceed with our visit. On the ride home, I listened to an organizing podcast and had 45 minutes to organize a game plan (my technique for getting control of my thoughts). When I got home, I told The Man Beast my plan. I didn’t mean to do it, but I started in on the bags, wax paper, and plastic wrap that were sitting in between the wall and microwave in the kitchen. I cleaned out a drawer and placed everything in it. The Man Beast took my lead and tackled the two drawers in our island (a task that he admits he’s been meaning to do for a couple of weeks). Next, I tackled the two drawers in my hutch. All of this took less than ten minutes, but the relief I felt from doing it and seeing the results, was immense. I went into the living room and threw away the newspapers that had been on the couch for a week. Why didn’t I throw them out sooner? I haven’t a clue. I think there are some things I ignore until they get too over stimulating. By then, they’ve gotten too overwhelming, too, and I shut down. After I threw the papers away, I went into the bedroom and ironed the basket of clothes I started ironing last week. It took me an hour, but I was determined to do it. While I was waiting for the iron to heat up, I gathered up all the dirty clothes in my bedroom and put them in the basket. I immediately felt better because I was making progress. These are small tasks that, if tackled when they first became a nuisance, would have taken minutes to tackle. My deep, dark secret: I get overwhelmed easily. This stems, largely, from being a perfectionist and a people-pleaser. You would think that if I were a perfectionist, my house would be spotless, my family would be perfect, and I’d have it all together. The real truth is the feelings of shame I possess for creating habits that put me in an overwhelmed state of mind consume me. I have a very guilty conscious and chastise myself constantly for “knowing better”. Where this comes from, I have no earthly idea. Not one person in my immediate circle of influence puts the kind of pressure I put on myself. So, now my rational mind has taken over during the moments of calm. (My desk is now de-cluttered and dusted. My living room is visitor-friendly - but by no means perfect). Now I can think. Now I can problem solve. The solution I come back to, time and time again, is routines. Maintenance. Sprints, not marathons. 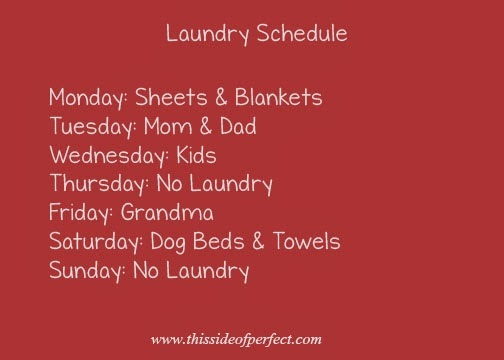 The one routine that has consistently worked for me is my laundry schedule. But sometimes, the little things – done consistently – make the biggest difference. My laundry schedule was one of those little things. And right now, that’s all I can do.